A native of Brussels, Belgium, composer-instrumentalist-singer Henri Seroka, 38, has been spending most of his time in recent years in Hollywood. His output as an author covers a pretty wide scope, apart from mainstream music and a specific variety of chanson (as exemplified for instance by the repertoire of Jacques Zegers) embracing also music for movies, television plays and serials, as well as even catchy tunes to accompany TV commercials… Of the cinematic soundtracks featuring his music one should mention at least Son premier ete (1976), Alice (1980), Ataturk (1982), Funeral Party (1984) or Flight of the Spruce Goose (1986). In 1984 he won the contest for Europe's Olympic signature tune, and 1986 saw his musical theme becoming the official tune of the world football championship. 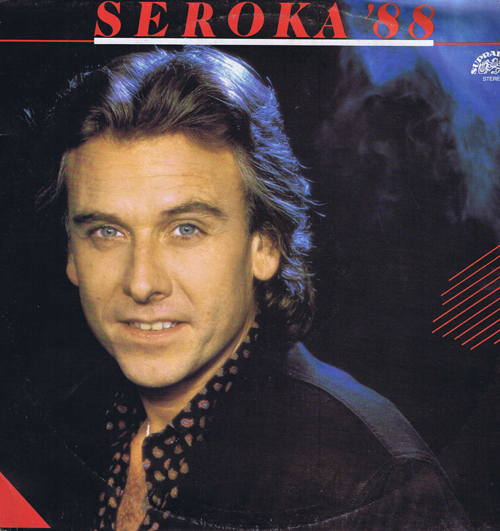 Moreover, his and Zegers's ballad, Pour Elle, was the 1983 Song of the Year in Belgium, and a year later Jacques Zegers sang another song from their common workshop, Avanti la vie, at the Eurovision Grand Prix final. The song then earned its authors a golden disc (the second for Seroka, who had already had one, for the Olympic theme). Henri Seroka's melodies figure in the repertories of a host of international performers, including the like of Lulu and Betty Dorsey in Britain, French vocalists Jean-Pierre Cassel and Isabelle Aubert, Peter Starker in the States, or, in German-speaking countries, Ivan Rebroff, Roland Kaiser and Gunter Gabriel, as well as, of course, Seroka's longtime collaborator, author, lyricist and singer Jacques Zegers (also released by Supraphon). And as Henri Seroka is a singer-songwriter, it is only logical for him to be the interpreter of many of his own tunes. Henri Seroka's occasional partnership with the Czech musician Karel Vagner is now finding its new climax in this joint album, recorded in Czechoslovakia. All of Seroka's tunes featured here have been arranged by the popular Belgian bandleader, arranger, composer and singer, Luc Smet, who also assisted in the recording; as for the Czech part of the program, Henri Seroka has chosen four songs by Karel Vagner, and one by Jiff Zmozek. While language-wise, side one of the album Seroka '88 is an all-French affair, side two presents Henri Seroka singing in English. Commenting on this duality he once joked: "There are situations where I myself don't quite know what language I 'm speaking. I just oscillate between Belgium and the States, a way of life that's dictated by my work. Even with Luc Smet we communicate in English, for you see, while Belgium is a small country, French is not spoken in all its parts…"
Besides the two golden discs Henri Seroka is the proud owner of three Grand Prix awards (one from Sopot, Poland, the Golden Orpheus, from Bulgaria, and one from Radio Luxembourg). Speaking about his work together with the Karel Vagner Group, he said: "Naturally I wish that the Czechoslovak audience would be as fond of the tracks as we were of this whole joint venture. I think we have all been tuned to the same wavelength, and if it now proves to be the wavelength of those who will listen to this Supraphon album, well, that'll be my latest - albeit unofficial - Grand Prix."